In enterprise geodatabases, the owner of the data can grant privileges on a feature dataset to let other database users view or modify the feature classes that they contain. All feature classes within a feature dataset must have the same privileges. When granting privileges for users or roles at the feature dataset level, the privileges will apply to all feature classes contained within the feature dataset. It is not possible to grant different privileges to different feature classes within a feature dataset. New feature classes added to the feature dataset will inherit the privileges set on the feature dataset automatically. See Grant and revoke dataset privileges for information on setting privileges on a feature dataset. When creating a new feature dataset, you must define its spatial reference. This includes its coordinate system—either geographic or a specific projection—as well as coordinate units and tolerances for x-, y-, z-, and m-values. 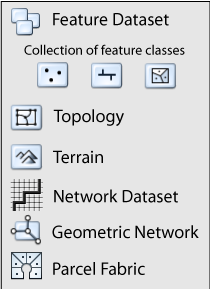 All feature classes in the same feature dataset must share a common coordinate system, and x,y coordinates of their features should fall within a common spatial extent.